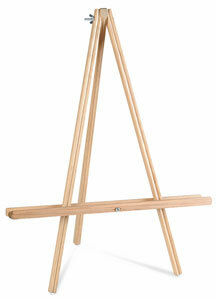 This low cost easel is made of pine and stained to a dark finish. It's comparable to the more expensive easels in many ways. It has multi-tilt options, a wide-ribbed canvas tray that adjusts easily, and non-skid rubber tips.